This guest blog is written by Preston Mutinda, an experienced and knowledgeable guide we had in Kenya during our African safari a couple of years ago. With his permission, I’ve modified his 2011 Christmas letter sharing his current activities. 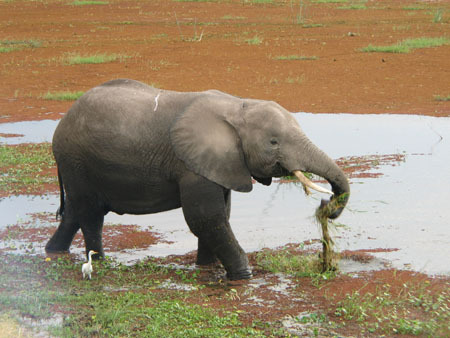 Preston continues to lead safaris geared to the specific interests of his clients. In addition he and his wife have established a center for wildlife education, a subject very dear to his heart. Imagine watching magnificent lions in the wild! Jambo! I trust and hope that you had a good year in 2011 and look forward to 2012 with happiness. The year 2011 was filled with fun and successful safaris and many children coming to learn at my Community Wildlife Education Center. During May I led a group safari with 8 guests from Defenders of Wildlife. They fund Lion Guardians who monitor lion movements and their survival. We started in Amboseli National Park using two 4-wheel drive Land Cruisers before continuing to Chyulu Hills National Park, Masai Mara and outer sections of Game Parks. 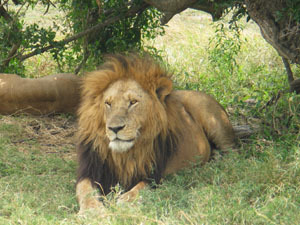 The highlight of the safari was tracking lions with the Lion Guardians using their study equipment. We found many prides and solitary males. Tree climbing lions are found only at Lake Nakuru. 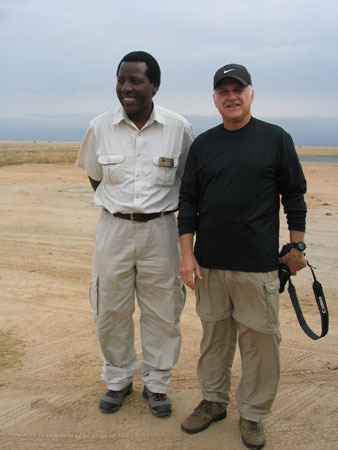 In my next safari in June I had 2 guests from the U.S. We visited Lake Naivasha and Lake Nakuru National Park. The wildlife population has increased a lot in Nakuru, and the highlight of the safari was watching four male olive baboons chasing away from their territory a female leopard. She disappeared in a thicket. 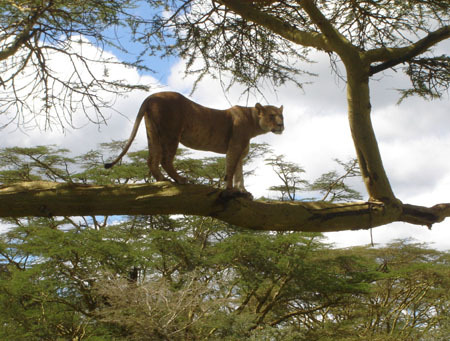 We also watched several female lions climb a yellow-backed acacia tree and sleep there for the whole afternoon. The two lakes provided us with lots of bird species. My third safari of 20 days started in September with five professional photographers and keen birders from California led by Buff and Jerry Corsi, who were returning for their sixth safari. Two 4-wheel drive Land Cruisers gave them space to film. We visited Amboseli National Park for 4 days, Samburu Game reserve 4 days, Lake Nakuru National Park 3 days, and Masai Mara 9 days. The highlight was finding12 wild hunting dogs in Samburu. As usual there was a major river crossing in Masai Mara when thousands of wildebeests and zebras crossed in the migration. The photographers invited me to visit California next May. The fourth Safari of 15 days started in October with four photographers and also birders from California. We visited the same areas as above. The highlight of this safari occurred when we watched two Caracal cats in Samburu playing together. The short rains started, and the dry spell ended bringing joy to all the wildlife. Elephants bathed in Samburu River every day. In Lake Nakuru lots of pelicans, flamingos and other bird species washed alkaline deposits from their plumages in the rivers feeding the lake. The last and fifth Safari started early November with a group of 10 birders and nature lovers led by Bob and Karen Brinker, here for their fourth Safari. The safari was exceptionally pleasant with fewer crowds in the game parks. We started by visiting Lake Nakuru for 3 days, Ol Pejeta Conservancy 2 days, Meru National Park 2 days, Buffalo Springs game Reserve 3 days, where we stayed in special mobile camp, Masai Mara 4 days, and Tsavo West National Park 3 days. We spotted 420 species of birds and had 18 sightings of lions including several prides with little cubs, 4 sightings of leopards, and 3 sightings of mother cheetahs with cubs. Almost all species of game had newborns during this time of short rains. The highlight was watching 2 big male lions in Lake Nakuru high up on a tree trying to turn downwards. They almost fell. Eventually we had to leave, and the next morning they were nowhere to be found. 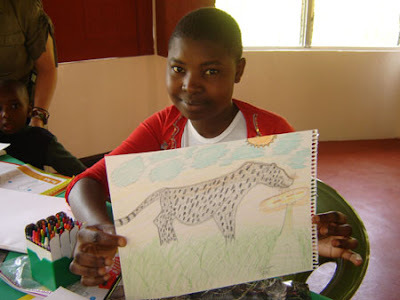 Children are eager to learn about wildlife in Kenya. In Masai Mara we watched a solitary zebra stallion that managed to cross the river after being chased by 3 crocodiles; one grabbed the zebra but let it go. At the end of the safari Bob and Karen Brinker visited my Wildlife Education Center where my family and I continue teaching children about wildlife, culture and conservation. 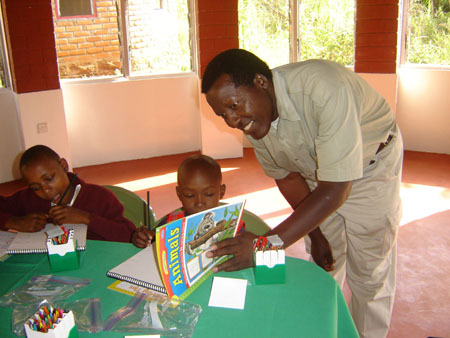 Preston enjoys teaching local children about wildlife. Impressive article!! I have always been fascinated towards Wildlife of Africa. I would love to explore Africa's wildlife for sure.